Why Vegetables Get Freakish In The Land Of The Midnight Sun : The Salt Long summer days in Alaska help cabbages, turnips and other vegetables grow to gargantuan sizes. These "giants" are celebrated at the annual state fair, which kicks off on Thursday. Giant Cabbage Weigh-Off 2013 winners (with placards, left to right): Scott Rob (92.1 pounds), Keevan Dinkel (92.3 pounds) and Brian Shunskis (77.4 pounds). 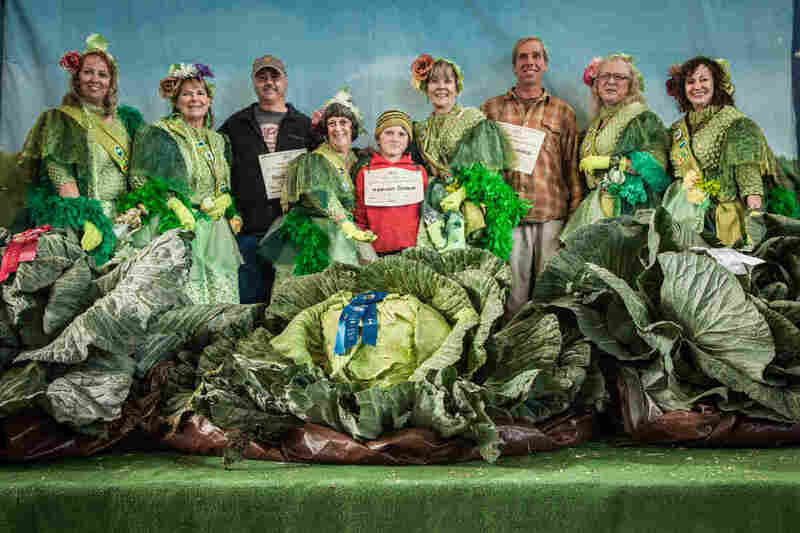 The growers are joined by the cabbage fairies, a group of women who for 15 years have volunteered at the cabbage competition. Everything in Alaska is a little bit bigger — even the produce. A 138-pound cabbage, 65-pound cantaloupe and 35-pound broccoli are just a few of the monsters that have sprung forth from Alaska's soil in recent years. At the annual Alaska State Fair, which opens Thursday in Palmer, the public will have the chance to gawk at giants like these as they're weighed for competition. It's "definitely a freak show," the fair's crop superintendent Kathy Liska, tells The Salt. "Some things [are so big], you can't even recognize what they are." Several state fairs have giant crop competitions, but Alaska is known for yielding particularly big specimens that wind up setting Guinness World Records. 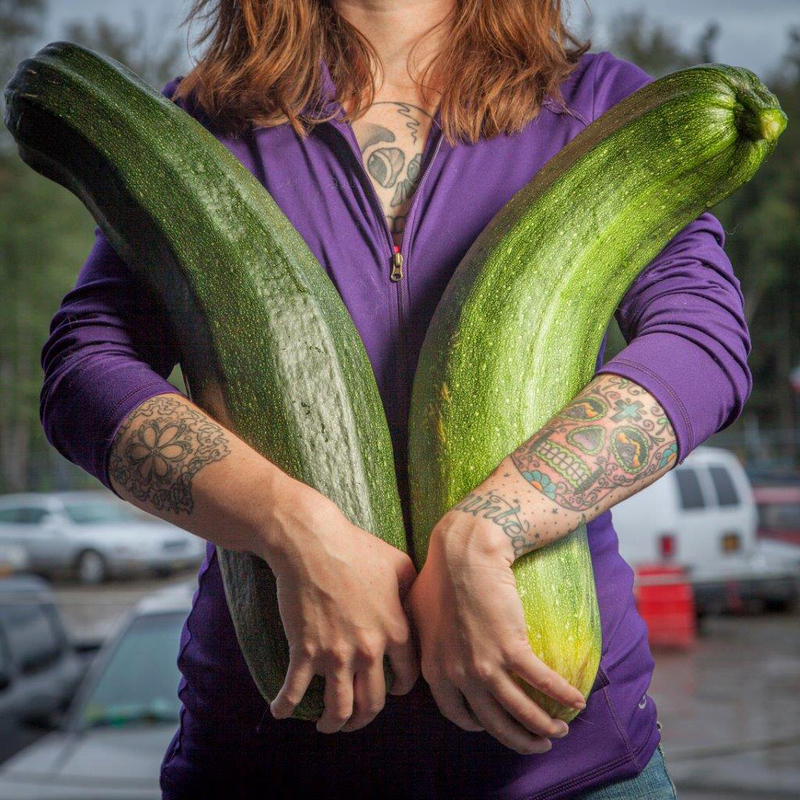 Alaska grower Brittney Kauffman holds two zucchinis she entered in a giant vegetable competition in 2013. "Alaska is just a hotbed for gardening, believe it or not," says Alaska State Fair crops superintendent Kathy Liska. "Everybody thinks that we're always under ice — no!" It's Alaska's summer sun that gives growers an edge, says Steve Brown, an agricultural agent at the University of Alaska Fairbanks who also serves on the fair's board of directors. Basking in as much as 20 hours of sunshine per day, Alaskan crops get a photosynthesis bonus, allowing them to produce more plant material and grow larger. Brassicas like cabbage do especially well, says Brown. The extra sunlight also makes the produce sweeter. "People often try our carrots here, and they think we've put sugar on them," Brown says. But many of the biggest ones — the real monsters — aren't flukes; they're a product of careful planning. Selecting the right seed varieties is just as important as the time spent in the sunlight, says Brown, who teaches a class on growing giants. Top Palmer growers like Scott Robb, who Brown calls a giant vegetables "Einstein," spend years experimenting with different varieties to get a prize winner. "Let's face it: You're not going to win the Kentucky Derby with a mule or a Shetland pony," says Robb, who holds five current world records for his large vegetables. "If you don't have the right genetic material, you're never going to achieve that ultimate goal." Indeed, it took him 20 years to break the cabbage record in 2012, when he brought in a 138.25-pounder. QUIZ: Which Of These State Fair Foods Are Faux? Hopeful giant cultivators start their seeds in January, under grow lights in greenhouses. For months, they transfer their plants into larger and larger pots until May when the ground is finally warm enough for them. Up until the fair, growers must protect their pedigreed vegetables. Robb said that when he started, he would stay up all night to guard his veggies from hungry moose; eventually he put up an electrified fence to keep them out. Brown also says serious growers may construct elaborate watering and fertilization systems for their produce to ensure they get exactly what they need. "It really reminds me of Frankenstein's laboratory," Brown says. "If you were to go visit somebody who was growing a giant veggie for this fair, I think the thing that what would impress you is how much science and technology goes into this." 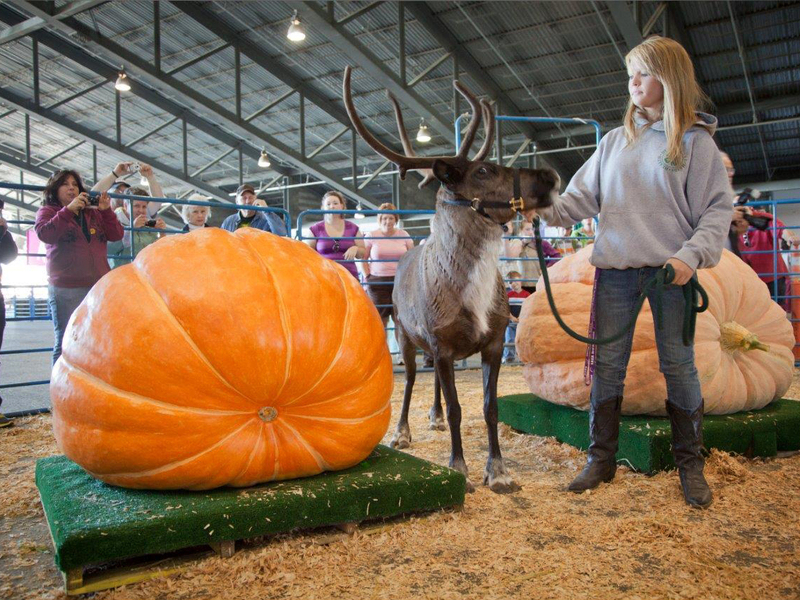 Ashleena Roberts holds a reindeer for scale next to a pumpkin in the Alaska State Fair giant pumpkin contest. Giants can sprout unexpectedly, too. Such was the case with Roger Boshears, a state fair herbs judge and hobbyist gardener who once took a second-place ribbon for a large tomato he pulled from his garden. "It's not something that we're aiming for," Boshears says of his fellow amateurs. "It's something that happens." Not all fruits and vegetables thrive in Alaska. Watermelons and tomatoes, for instance, which love the heat, have a tougher time. But "there are Alaskans that will grow watermelons in greenhouses just to be able to say they did it," Brown says. As the vegetable hotbed of Alaska, the town of Palmer has its roots in a New Deal-era program to bring Midwestern farming families north to establish an agricultural colony. The fair held there has two rounds of crop competitions along with separate competitions for pumpkins and, the main attraction, cabbages (on Aug. 29). The winning specimens are donated to the animals at the Alaska Wildlife Conservation Center when the fair concludes. Robb says he has high hopes for winning the title for some rutabagas he's been cultivating, but he's worried that fellow Alaskan and friendly rival Steve Hubacek could threaten his perch as the cabbage record-holder. "I'd hate to lose it right away," Robb says of his record. "Then again, if Steve beats me, boy, my hat's off to him because I know how hard it is." Whitney Blair Wyckoff is a writer and editor based in Washington, D.C.